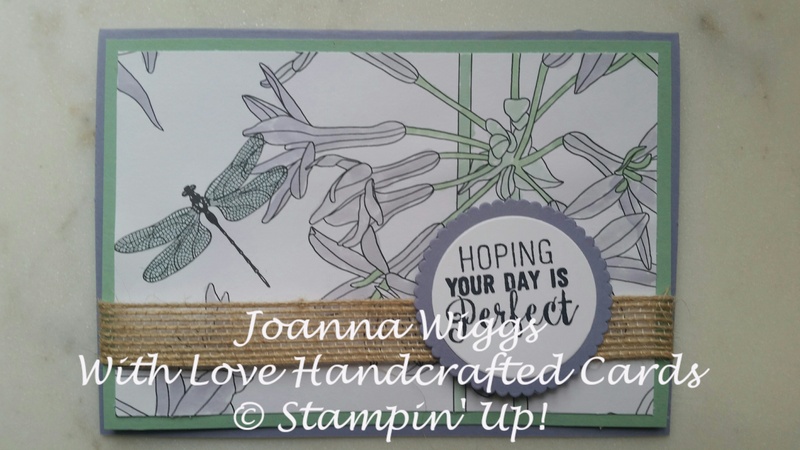 Wisteria Wonder is my favourite, current Stampin Up colour. So when I saw the latest Colour Inkspiration Challenge I was so excited. Now I have to admit when I first saw the ‘Inside the Lines’ DSP, which is a free Sale-a-bration item, I did not fall immediately in love with it. However I have come to love the paper. This week the challenge was to use Wisteria Wonder, Garden Green, Mint Macaroon, Soft Sky and Whisper White. To me these colours reminded me of a garden and therefore the ‘Inside the Lines’ DSP was a natural fit for this challenge. I used my aqua painter and ink pads to water colour the flowers. I also created this card on different DSP…. Here is a link to my you tube channel showing you how I made the card.